I'm not gone, just in bunny heaven. Man, nearly a year since my last blog? I unpacked all my books on to a beautiful new bookshelf last night, and had way too much fun flipping through the SG Geekology book. Did you guys know I made it in to that one? Too cool. Thought I'd poke around the site for a while on this glorious Thanksgiving day.
. Did you guys know I made it in to that one? Too cool. Thought I'd poke around the site for a while on this glorious Thanksgiving day. And speaking of gratitude, I'd like you to meet the little lady who eats up all my time and cilantro - Libby! She's half flemish giant (10 lbs!) and one hundred percent amazing. If you're thinking about a pet, check out your local adoption agencies. Libs was rescued by the amazing people at Rabbit Rescue. If you don't already, you can stay in touch with me over on my Instagram. Tiny girl? 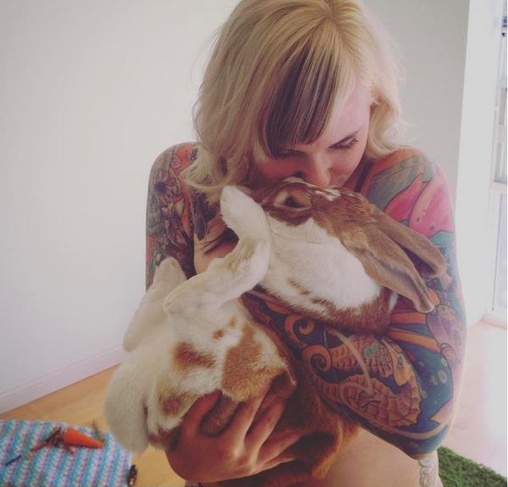 Gigantic bunny? 100% Adorable. A year is a long time, but not really that long. I grew tired of seeing the start of 2014 on my page. Here's the thing - it was a good year. It was full of education, strong friendships, and deep love. It was also a year packed with hardships, obstacles, and defeat. But that being said, it felt like a year of work done in preparation for something bigger. , as I stand by her side as a "maid of honour." I can't think of a better way to usher in 2015 full of love, and a renewed commitment to see love in all I do. So, I'll be back. I feel I have more love with share with all of you. Here's a picture of me in a festive onesie, as a reward for reading this ambiguous post. Hope to see a new set of you, lovely one. Hope 2017 has marvellous potential for great things! So I finally took the time to see how blogs are updated these days.